It may seem crazy to the uninitiated, but hitchhiking is by far my favorite way to get around Guatemala. It’s fast, it’s often free, and most importantly, it’s safer than the camioneta (chicken buses). This is where my readership collectively double takes. “Safer than buses? But what about kidnapping and car crashes and lions and tigers and bears?” Well, beyond the fact that most of those things, especially the ones that don’t involve wild animals, are more likely to occur on the public transit system than while hitchhiking it’s also a much more comfortable experience. For one, buses are basically giant rolling pinatas for thieves. If you were about to risk your life holding up strangers for valuables, do you pick the truck that has 3 (probably) locals or the giant bus jam packed with 50 individuals, many of them rich foreigners if you pick the right route. It’s basic risk versus reward, you stand to gain so much more for equal risk and if there is one thing we can count on it’s that humans will generally act in self interest. Now in regards to vehicular safety. If you have to ask this question, you’ve probably never been on a camioneta. These guys feel they are the kings of the road and demonstrate this by swinging into the oncoming lane in their, albeit, beautifully and immaculately painted buses, on tiny 2 lane mountainous roads; as if daring anyone who might have been around the corner to challenge their almighty authority. They are the brazen peacocks of the Guatemalan driving world. I’ve been in more than one camioneta that came up on 2 wheels around such turns, it can be hair raising. Trucks on the other hand don’t have this cultural archetype to fulfill. About 80% of the rides I catch are considerably safer than the camioneta, and the other 20% may approach chicken bus levels of crazy, but never quite make it. Furthermore the drivers of private vehicles have no profit incentive to go extremely fast all the time. It’s generally a much safer and more comfortable experience. And that brings me to the next pro: comfort. It is so much more comfortable to recline in the back of a truck winding its way through the highlands of Guatemala watching the clouds pass lazily by than it is to be horribly compacted in seats designed for people half your size and half the number of people crammed onto them. The back of a truck however, is the perfect place to take in the incredible landscapes of this beautiful country. I don’t buy gear often (or really anything), but when I do I research extensively to make sure my limited resources stretch the furthest. When possible in this guide, I’ll make recommendations. and it’s the best backpack I’ve ever owned, but it seems to have been designed specifically for people with my body type. That is to say long and lanky. If you’re short and burly I imagine it wouldn’t be as comfortable for you. A map. Anything with the roads will do. A camera and something to waterproof it. For the amateur photographer I’d recommend the Cannon “s” line, it’s the best of the best and as close as you can get to a dSLR without actually having one. When I bought mine the s100 was the latest and greatest and it served me well until it’s theft. The S120 is the latest successor. The best thing about this camera is that, unlike most point and shoots, it allows you full manual control over everything and so it’s a great stepping stone into the world of photography. Its worth noting that the older models are still available, can be picked up cheap on Craigslist, and are still some of the best point and shoots to be found. Headphones, music and a few episodes of This American Life on hand for those rides that go on forever. A water filter, you never know when you’ll end up camping or just needing some clean water in a remote place. My water filter of choice is the Katadyn Vario. It’s easy to use, long lasting, reliable, and has a high output volume, which is nice for when I find myself guiding. I carry a big knife, for utility purposes; knives come in handy all the time as levers, hammers, and even sometimes to cut things. I use the Ka-Bar Black Tanto and have been really happy to have it. Keep it polished. It can be nice to have a GPS, but then it can be even nicer not to have it (or even a map for that matter). But for those times when you will be trekking into the jungle on unmarked paths, it’s nice to have. I use the Garmin eTrex 20 Worldwide Handheld GPS Navigator . Compass, with the same caveat as above. I use the Suudo M-3D as it makes using topographical maps a breeze (but really, usually it’s more fun to get lost, only carry this if you have to). Get yourself to the exit of whatever town or city you’re in. You can walk, tuk tuk, taxi, or even just hop a camioneta to the first stop outside of town. The best place to wait is next to one of the many giant speed bumps to be found in the satellite villages of most cities; people are much more likely to pick you up if they have to slow down or stop anyway. Point in the direction you’re going. Don’t put your thumb out, half the time people will think you’re just giving them a thumbs up and return it enthusiastically. Hitchhiking Guatemalans point towards their destination and then the driver will either pick you up, point down to signify their staying in town, or point in some other direction that they will soon be heading in. It’s rare that you won’t get any response. Let them know where you’re going, hop in the back of that truck and enjoy the ride. I’ll be asked to pay between 10% and 50% of the time. Of about 25% of those times, if I leave it up to them to tell me a price, they will try and rip me off. The easy way to handle this is to calculate how much the trip costs yourself and just hand them the correct amount. You can do this either by asking other passengers (often those who charge will have several) or just keeping track of the time, it’s 10Q an hour for chicken buses and trucks in Guatemala. Don’t argue or debate, just hand them the money and walk away. But that’s really only a small fraction of the time, typically it’s free and a good amount of the time they’ll actually try and buy you lunch or a drink. You eventually get an eye for who’s going to charge, who isn’t and who’s going to try and rip you off. Be friendly, everyone else is here. Move quickly, don’t make people wait for you; they’re doing you a favor. Unless its raining, I prefer to ride in the back of trucks for comfort and security reasons; it’s easier to escape if necessary (although in a year of consistently hitchhiking everywhere I’ve had not a single bad experience). Most vehicles in Guatemala are trucks so that’s not hard. Don’t shy away from those semis, they are some of the most fun to ride. I’m going to Guatamala soon as I have a flight to catch in Honduras and I’m currently in Mexico. I’m a full time hitchhiker traveler, so this really helped me. Thanks a lot for sharing! No problem! How’d it go? thanks for the info! was a little worried about hitching there but feel better about it now. i fly to belize in december and am hitch hiking my way to colombia from there alone. is it just as safe on your own do you think? 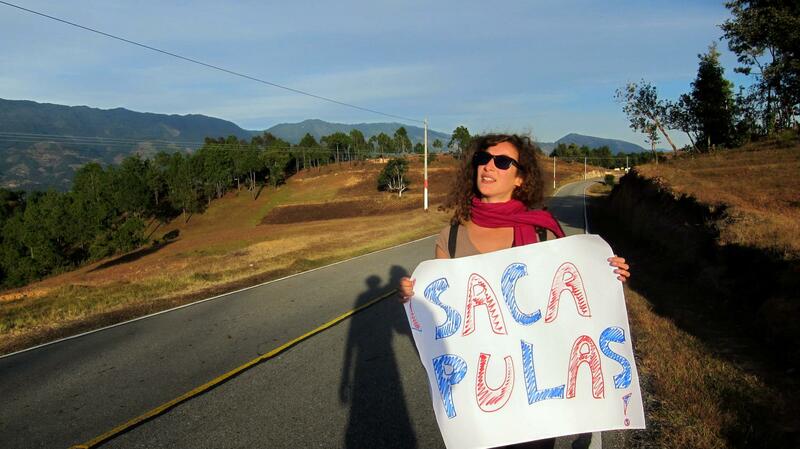 have you ever hitch hiked in south american countries? No problem! I think it’s best to go with someone else. Do you speak Spanish? Can’t really speak to what it’s like in other countries, only hitchhiked in Guatemala and Mexico. Shoot me a message if you end up passing through Quetzaltenango! Powered by C8H10N4O2 and water clocks.